You can work up a sweat shovelling a single driveway, but here's some perspective — Halifax winter operations crews removed 764 truck loads of snow on Tuesday night in their continuing efforts to clean up. City crews are relying on others to flag problem streets for emergency vehicles and buses. Jennifer Stairs, a spokesperson with the Halifax Regional Municipality, said Halifax Transit, Halifax Regional Fire & Emergency, Halifax Regional Police and EHS members have been pointing out clogged roads around the city. "Crews spent the past couple of nights working to widen those streets first, and then focus on other areas where visibility is poor. They're making good progress," she said Wednesday. Stairs said the identified streets don't encompass all of the sticky spots around the city, just those that have been pointed out. She said snow is being dumped at several spots around the city on fenced-in municipal property. "We don't disclose the actual locations," she said. To help make the cleanup easier, the city has extended its overnight parking ban from 1 a.m. to 6 a.m. on Thursday. Car owners who park on the street can have their vehicles towed, but that's not always the case. There's a car encased in ice on Robie Street, plastered with tickets. Another car on Spring Garden Road is stuck in a cube of concrete-like snow. "The towing companies won't do the work to dig and chip the vehicle out in order to tow it," said Stairs. 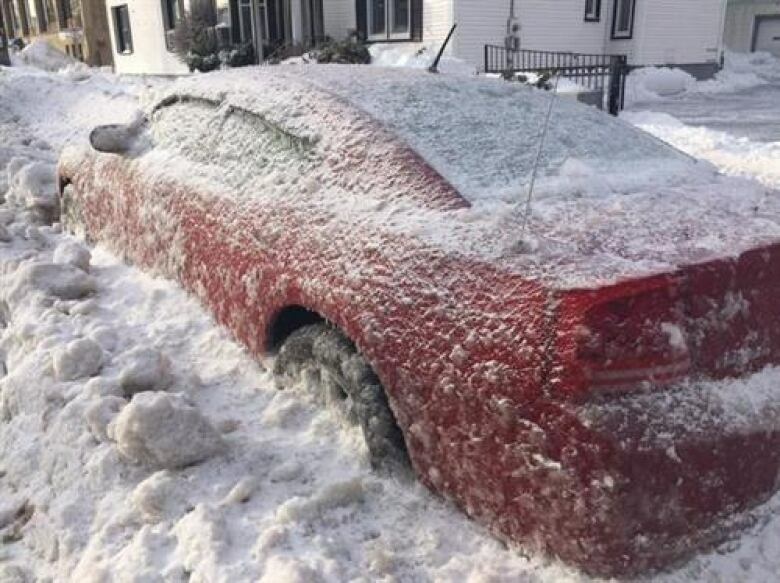 "It is ultimately the resident's responsibility to dig out their vehicles and find off-street parking. ‎There are instances of vehicles left on the streets causing problems for crews and they also have the potential to pose problems for emergency vehicles on narrower streets."